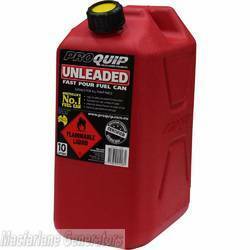 Pro-Quip fuel cans are a market leader for diesel. Pro-Quip fuel cans meet Australian Standards (AS2906) for fuel containers. These cans are for petrol. Pro-Quip fuel cans are a market leader for diesel and petrol containers. Pro-Quip fuel cans meet Australian Standards (AS2906) for fuel containers. 10 litre cans we have in stock are for petrol. These Jerry Cans are rustproof, unbreakable and non-corroding and meet or exceed Australian and New Zealand standards.